Right up until the eighth grade, they knew very little about instruments, let alone being able to play them. It was only after someone from their village offered them a drum to play around with that they realised what they’d been missing all this time. “The first time we laid hands on the instrument, it was like we fell in love with music. We had to queue up because the drum was kept in an abandoned old house in our village, Libhoo, but it was worth it. 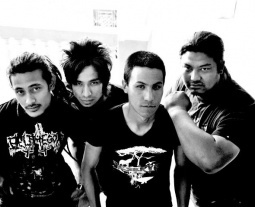 And that was how we got started,” say guitarist and vocalist Sawan Dev Shrestha and drummer Umesh Shrestha, founders of Sawan Dev and the Black Hawk. The band was officially formed in 2003 and released its first album Midnight a year after. This was followed by their second album Six String. In 2010, the duo was joined by Gautam Tandukar on rhythm guitar and Suresh Maharjan on bass—both from the neighbouring village of Siddhipur.